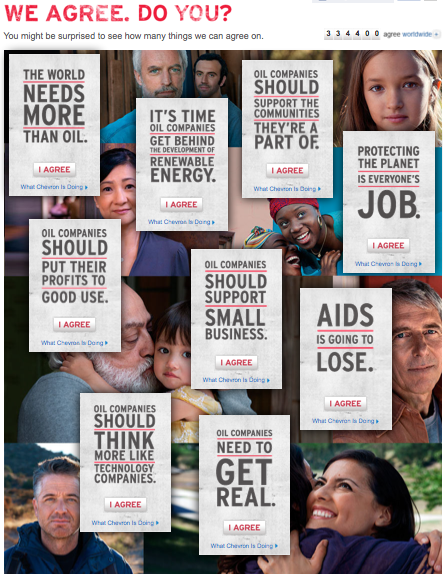 In 2010 Chevron, the second largest oil company in the world, prepared to release a campaign called "We Agree" which featured messages from people explaining what they think the oil company should do supposedly guiding the company's decision making. Hours before this was due to launch, activists published a press release from a spoof Chevron domain, launching a fake “We Agree” site. The fake site featured four “improved” advertisements. The stunt led by Rain Forest Action Network, Amazon Watch and the Yes Men, simultaneously made Chevron look stupid, while also presenting evidence to counter their 'greenwashing' strategy.